When tax season comes around, there comes a decision that has to be made. Each tax season comes with the choice between hiring a tax professional or doing your taxes yourself. The average person who does their own taxes spends approximately 13 hours preparing their tax return. If you are like most of us and don’t have that kind of time, hiring a professional tax lawyer is a great option. The question then is posed, how do you find the right tax professional for you? When seeking out a tax preparer, do not be afraid to ask questions.Even when you’re seeking out help, you’re legally and financially responsible for everything on your tax return. So, this is not something to take lightly. Asking the right questions will tell you a lot about how they do their job, and whether or not they’re the right tax professional to work with you and your tax return. Ask about their experience. You want a tax professional who is experienced working with individuals. If their primary market is businesses, or another kind of entity, then they might not be the right fit. When and how can they be reached? If they are not available after the April due date, then they may not be the right person who prioritizes their clients. Do they offer electronic filing? In this case, they should. Most often it’s a requirement for tax preparers to use electronic filing. What do they charge? The average cost of a tax professional is $150. If they don’t give you that information, or say that they charge based on your refund, that is a red flag. Your taxes are not something to take lightly. 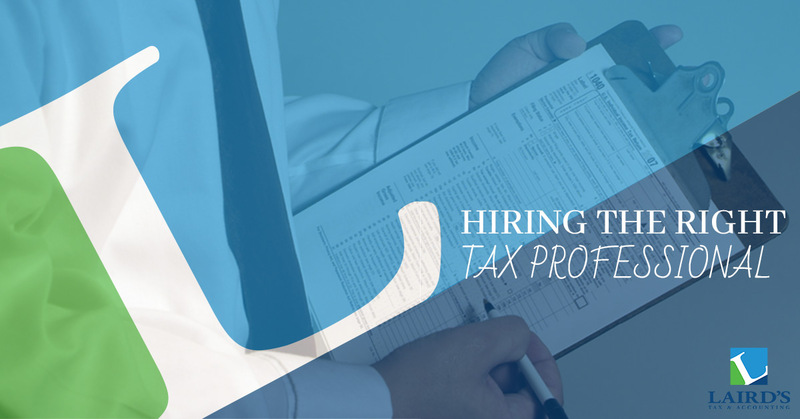 When hiring a tax professional to work with, you want to make sure they are trained and prepared to do their job correctly. Most people seek out tax professionals because they want to ensure their taxes are done correctly. To do this, make sure they have a Preparer Tax Identification Number, or a PTIN. Make sure the tax preparer puts the PTIN on your tax return. That is required by the IRS. Additionally, do not be afraid to also ask for their experience, education background, and references. Tax professionals who say they can get you a bigger refund than the competition. A tax preparer who’s fee is dependent on the size of your refund. This means that there is the potential that they are trying to overcharge you. They should be charging you an hourly rate. Make sure they are not employed by a big chain. According to lifehacker.com, a recent study reported that nearly all of the returns performed at big chain tax preparation companies were incorrect in some way. To prevent the risk of this happening, you’re better off choosing a tax professional that you can trust to do a good job, and work with for a long time. Do not sign a blank tax return. Your tax preparer should sign it before handing it over to you to sign, and if they don’t, that’s a sign of something fishy going on. Because you’re trusting your taxes and tax refund to this individual, you want to make sure you like them and feel comfortable working with them. Your references should be able to give you a sense of what it’s like to work with them. You also should be able to ask questions when you first meet them to get a sense of how they do their job, and what they would do in specific situations.